The Wujiquan System is comprised of 36 Characters: 18 kinds of natural climatic phenomena, and 18 of Qi applications. Wujiquan, the Mother Art of Taijiquan; from Wuji, comes Tai-Ji. Shifu Alan Tinnion was privileged to be taught the ENTIRE Wujiquan System (ALL 36 Characters, including Wuji Qi-Gong, Wuji-Bagua, checking, pre-arranged two-man forms, Wuji Sword and other weapons) DIRECTLY IN PERSON by Grandmaster Chee Kim Thong, as a result of Shizu Chee assessing that Alan had the right Character and natural aptitude for learning Accurately this rare, high-level, boxing system in its entirety. Since his Master’s passing, and due to the current and on-going threat to the continuation of this Art posed by those who only know it in part, and, or teach what they know in diluted/’simplified’ forms in the West, Shifu Alan Tinnion wishes to teach the Authentic Wujiquan in order to preserve and promote the Art in its original, unadulterated form, as Shizu Chee Kim Thong wished him to do. IT MUST BE STATED that it was only after many years of careful assessment of character and aptitude [to learn fully, and grasp the Principles of Wuji] by Grandmaster Chee Kim Thong, that Alan was taught the Full Wujiquan System. It was at the specific request of Shizu Chee - and in his direct personal presence - that Wujiquan was first taught in the West by Shifu Alan Tinnion. The science of therapeutic breathing and interrelated co-ordinated movement of body and limbs, used for therapeutic benefit and, or martial application. Qi-Gong is practiced to generate, retain, and direct Qi: as such it is most well-known for being practiced mainly for health benefits of many kinds, but is an integral part in the development of the many different varieties of internal and external boxing systems. 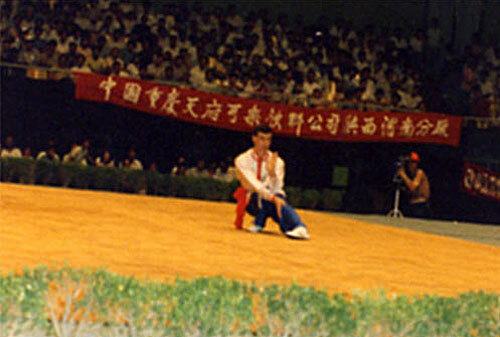 Northern Style traditional Gong Fu is characterised by swift advances and retreats, leaping and kicking, wide stances, and particularly Long Fist (a renowned example of which is Taizu Chang Quan, the creation of the first Song Emperor, Zhao Kuang Yin). Taken together in their modern, known forms, Xing Yi Quan, Bagua Zhang, and Taijiquan date from the same period (Ming and Early Qing Dynasties) of the history of the traditional Chinese fighting arts, and are known as ‘The Three Sisters.’ attributed to ‘Wudang’ Daoist Gong Fu. Bagua’s direction is circular, emphasising use of horizontal strength and the open palm. 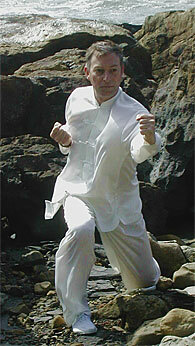 The core concepts involved in Bagua Zhang are undoubtedly ancient. ‘Zhang’ means Palm, and so in the context of martial arts and the circumstantial variations of the eight trigrams, means the use of the open hand rather than closed fist, combined with associated footwork. Bagua Zhang is a martial art based on the concept of perpetual change and adjustment to circumstances, to enable the exponent to overcome the physical force of an opponent with skill: see traditional Bagua footwork chart to right. 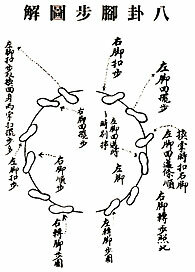 The soft/internal boxing Eight Trigram System, as we know it today, is derived from a certain Dong Hai Quan [Chuan], born in 1813 in Hebei Province. Bagua Zhang itself is based on the concept of change symbolized by the EIGHT TRIGRAMS (‘Ba Gua’) of the BOOK OF CHANGES [I Ching/I Jing] which represent all natural phenomena in the cycle of change to which all living things, including man, are subject. Tai-Ji is a Traditional Chinese Art practised for mental, physical, and spiritual discipline for cultivating the internal energy system. Tai-Ji is unique among the ‘Three Sisters’ [Xing Yi, Bagua Zhang, and Tai-Ji] in having the greatest affinity to Wuji – the first, most ancient of the Chinese Internal Arts (of which the ‘Three Sisters’ are the most well-known, dating as they do from more recent times) – in that both Tai-Ji and Wuji, in addition to their renowned fighting application, also provide very great benefits to physical, mental, and ultimately, spiritual well-being. Tai-Ji applies the concept of yin yang interplay to fighting: meeting force (yang) not with force, but with softness (yin) which through sticking and adhering to the opposing force comes to absorb and weaken it, until it can be easily redirected or beaten with minimal effort. Tai-Ji Quan’s creation is attributed to the legendary figure of the late Song Dynasty Daoist Zhang San Feng, but it is certain that the art was being practiced in elementary form long before his day – just as the older, and partly related, lesser well known art of the Wuji similarly has origins still more ancient. Xingyi’s direction is linear and stresses the use of vertical strength and the fist. 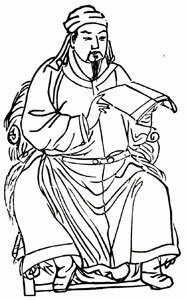 In the case of Xing Yi, the concepts of the interplay of yin and yang are expressed fully in the complete name of the system ‘Heart-Mind Six Harmonies Boxing,’ the name given it by Ji Long Feng. The Six Harmonies are comprised of three yin and three yang. As regards the three Internal Harmonies, the heart/desire harmonises with the intent; the intent harmonises with the Qi or vital energy; the Qi harmonises with the physical strength. Concerning the three External Harmonies, the shoulders harmonise with the hips; the elbows harmonise with the knees, and the hands harmonise with the feet. Since its inception, Xing Yi itself has been regarded by many Chinese military historians of later times as the internal boxing system most adaptable to the needs of military combat. The origins of Xing Yi Quan, the oldest of the Three Sister Internal Arts, are shrouded in mystery, for legend attributes its creation to the renowned Song Dynasty general, Yue Fei (1103-1141 CE: above right), who created a boxing style called ‘Xin Yi Liu He Quan’ [Heart-Mind Six Harmonies Boxing]. The earliest verifiable historical information concerning this System refers to Ji Long Feng – who lived during the early 1600’s towards the end of the Ming Dynasty - of Shanxi Province as being the first to teach the art of Xin Yi Liu He Quan. 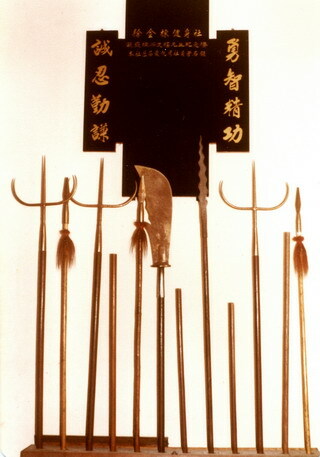 Ji Long Feng was a great master of spear fighting techniques, from which he drew inspiration for the creation of the Xing Yi System. 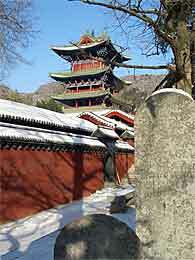 The philosophic concepts on which the system is built provide yet another instance of the influence upon the martial arts of core ancient Chinese metaphysical and spiritual concepts, found in their most concentrated and vibrant form in Daoism. We teach a selection of Traditional Chinese martial weapons (including those listed below) sets via specific weapon-related special seminars and short courses: Weapon Sets include SHORT and LONG Weapons. PLEASE NOTE: We ONLY teach traditional weapons sets.